Riviera Resort Royal Style - Here is Riviera Long Dress in Royal Blue Satin, a luxurious silk feel dress that is perfect for the vacation on the Riviera or to enjoy all the summer vacations’ special occasions at home. Regardless of location, Riviera Long Dress will make you feel like you’re a queen on a five-star resort- all inclusive, everything within reach. 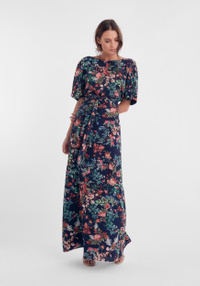 Riviera Long Dress has a figurative upper with a wide skirt. An elastic waist with adjustable tie bands. In the back runs a deep neckline. Flares runs from the shoulders all along down to the waist. Lining consisting of 96% Polyester and 4% Elastane. Riviera Long Dress is a perfect gala dress, bridesmaid dress or any festivities. Can handle machine wash. True to size. See also Mindy Dress and Amelie Dress in same Royal Blue Satin.